Vitamin C (or ascorbic acid) is a water-soluble vitamin required for a number of metabolic processes in living organisms. As a vitamin, ascorbic acid is an organic (carbon-containing) nutrient obtained through the diet and essential in small amounts. While plants and most animals are able to synthesize ascorbic acid endogenously (internally) from glucose, a small number of species, including higher primates and guinea pigs, have lost the ability due to a defective gene and must acquire this essential nutrient from their diet. It serves a cofactor in several vital enzymatic reactions, most notably the synthesis of collagen, the major protein of connective tissues, such as skin, bone, cartilage, and tendon. It serves as a general antioxidant, protecting the body against oxidative stress, which is caused by an imbalance between the production of reactive oxygen and the biological system's ability to readily detoxify the reactive intermediates. These disturbances can cause toxic effects through the production of peroxides and free radicals that damage various components of the cell, including proteins, lipids, and DNA. It stimulates the immune system and aids in the absorption of iron from plant foods. The intricate coordination in biological systems can be seen in the role of vitamin C in synthesis of collagen in humans. Vitamin C acts as an electron donor for three enzymes participating in the synthesis of collagen. If vitamin C is missing, then the collagen synthesized in its absence does not function properly, resulting in symptoms of the disease scurvy. Indeed, the name ascorbic acid is derived from scorbuticus (the Latin name for scurvy), since the shortage of this molecule may lead to scurvy in humans and other animals that require ascorbic acid in the diet. Scurvy, once common among sailors and soldiers without access to foods containing vitamin C, is characterized by the formation of liver spots on the skin, spongy gums, and bleeding from all mucous membranes. The importance of dietary balance is reflected in the role of vitamin C, for sailors would take many provisions for long voyages, but the lack of food with vitamin C would lead to these severe symptoms. Fresh fruits and vegetables, such as citrus fruits and broccoli, are generally a good source of vitamin C. However, the amount of the nutrient depends on factors such as specific growing conditions, transport, and method of preparation, as the molecule is unstable at high temperatures and reacts with oxygen when exposed to air. Ascorbic acid is also available as a dietary supplement, and was the first vitamin to be artificially synthesized. As a food additive, vitamin C is used as an antioxidant preservative and an acidity regulator. The daily requirement and nutritional value of vitamin C are matters of ongoing debate. The current RDA established by the U.S. National Academy of Sciences is between 65 and 90 milligrams for an adult; however, pro-vitamin C advocates believe this number is severely low, citing the fact that related species consume 20 to 80 times this reference intake. Claims of vitamin C’s health benefits range from its putative role as a cure for the common cold and as a preventative of heart-disease to more controversial assertions that it may be a possible treatment for cancer, SARS, and AIDS. None of these claims have been supported by long-term clinical trials. A three-dimensional model of an ascorbic acid molecule. Black represents carbon; red, oxygen; and white, hydrogen. Ascorbic acid is a weak organic acid that appears as a white, crystalline compound. Structurally, it is related to the six-carbon sugar glucose, from which most animals are able to derive the molecule in a four-step process. Like glucose, ascorbic acid is soluble in water. 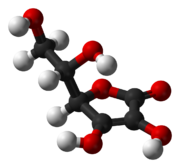 The ionized form of ascorbic acid is known as ascorbate. The ascorbate ion represents what is called the pharmacophore of vitamin C; that is, the structural feature (or set of features) responsible for the molecule’s biological activity (Gund 1977). It is the presence of the ascorbate ion that contributes to vitamin C’s role as a strong reducing agent (antioxidant). Ascorbate occurs in two forms, both of which are mirror images of the same molecular structure (enantiomers). Vitamin C is specifically the L-enantiomer of ascorbate; the D-enantiomer has no physiological significance. L-ascorbate naturally occurs either attached to a hydrogen ion, forming ascorbic acid, or joined to a metal ion, forming a mineral ascorbate. When L-ascorbate carries out its reducing function, it is converted to its oxidized form, L-dehydroascorbate, which can then be converted back to the active form in the body by specialized enzymes and the peptide glutathione. Biological tissues that accumulate over 100 times the blood-plasma level of vitamin C include the adrenal glands, pituitary, thymus, corpus luteum, and retina (Hediger 2002). In humans, vitamin C acts as an electron donor for eight different enzymes in the synthesis of important biochemicals (Levine et al. 2000). Three of these enzymes participate in the synthesis of the fibrous protein collagen, a major component of connective tissue (Prockop et al. 1995; Peterofsky 1991; Kivirikko and Myllyla 1985). These reactions add hydroxyl groups to the amino acids proline or lysine in the collagen molecule, yielding hydroproline, an amino acid that gives the collagen molecule its triple-helical structure by forming intrastrand hydrogen bonds. Collagen synthesized in the absence of ascorbate has a lower melting temperature than that of the normal protein, making the molecule less stable. The abnormal fibers formed by insufficiently hydroxylated collagen contribute to the skin lesions and fragile blood vessels found in scurvy. Thus, vitamin C is essential to the development and maintenance of scar tissue, blood vessels, and cartilage (McGee 2007). Along with vitamins A and E, and a group of related compounds called coenzyme Q, vitamin C also acts as a general (i.e., non-enzyme-specific) antioxidant. Antioxidants work by making themselves available for energetically favorable oxidation. Free radicals, which may be produced by the body or generated by environmental conditions, such as exposure to ultraviolet light and tobacco smoke, contain an unpaired electron and thus are highly reactive. They may, for example, oxidize (take electrons from) the lipid molecules that make up cell membranes and other vital tissues, altering their function. Antioxidants like ascorbate react readily with these free radicals before they can react with other compounds in the body. Radicals oxidize ascorbate first to monodehydroascorbate and then to dehydroascorbate. The radicals are reduced to water, while the oxidized forms of ascorbate are relatively stable and unreactive. Goats, like almost all animals, synthesize their own ascorbic acid. The vast majority of animals and plants are able to convert glucose into ascorbic acid through a sequence of four enzyme-driven steps. The glucose needed to produce ascorbate in the liver of mammals and perching birds is extracted from glycogen (the storage form of glucose) (Bánhegyi and Mándl 2001). In reptiles and birds, the biosynthesis of ascorbate is carried out in the kidneys. Among the animals that have lost the ability to synthesize ascorbic acid are simians, guinea pigs, the red-vented bulbul, and fruit-eating bats (Expert Group on Vitamins and Minerals 2003). Thus, along with other members of the ape family, humans have no capability to manufacture vitamin C. The cause of this phenomenon is that the final enzyme in the synthetic process, L-gulonolactone oxidase, cannot be produced due to a defective gene for the enzyme (Harris 1996). This genetic mutation, which assumably occurred in the course of evolution, has not led to the extinction of these species because vitamin C is prevalent in their food sources, with many of their natural diets consisting largely of fruit. It has been noted that the loss of the ability to synthesize ascorbate strikingly parallels the evolutionary loss of the ability to break down uric acid. Uric acid and ascorbate are both strong reducing agents. This observation has led to the suggestion that in higher primates, uric acid may have taken over some of the functions of ascorbate (Proctor 1970). 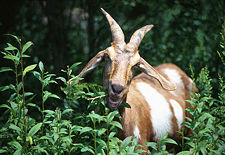 An adult goat, which is a typical example of a vitamin C-producing animal, will manufacture more than 13,000 mg of vitamin C per day in normal health and as much as 100,000 mg daily when faced with life-threatening disease, trauma, or stress (Stone 1978). Trauma and injury have also been demonstrated to use up large quantities of vitamin C in humans (Long, et al. 2003). However, increased vitamin-C recycling efficiency has been cited to explain why the human requirement is far lower than that of ascorbic acid-synthesizing mammals (Linster and van Schaftingen 2007). 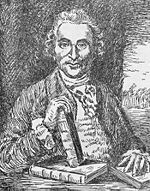 James Lind, a British Royal Navy surgeon who, in 1747, noted that a quality in certain fruits prevented scurvy. 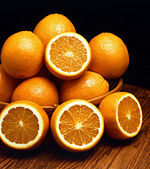 Scurvy is a disease caused by vitamin-C deficiency in humans and other animals incapable of synthesizing ascorbic acid. Since the body cannot store vitamin C, supplies are quickly depleted if fresh sources are not consumed through the digestive system (McGee 2007). As explained above, collagen synthesized in vitro in the absence of the vitamin C is too unstable to meet its function, which results in the skin lesions and fragile blood vessels characteristic of scurvy. Throughout history, scurvy was common among those with poor access to fresh fruit and vegetables, such as remote, isolated sailors and soldiers. For example, in 1536, the French explorer Jacques Cartier, exploring the Saint Lawrence River, relied on the local natives' medicinal knowledge to save his men who were dying of scurvy. He boiled the needles of the arbor vitae tree to make a tea that was later shown to contain 50 mg of vitamin C per 100 grams (Martini, 2002). Citrus fruits were one of the first sources of vitamin C available to ship's surgeons. 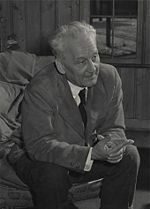 Albert Szent-Györgyi, pictured here in 1948, was awarded the 1937 Nobel Prize in Medicine for the discovery of vitamin C.
The name antiscorbutic was used in the eighteenth and nineteenth centuries as a general term for those foods known to prevent scurvy, even though the underlying compound responsible for their effectiveness was not yet understood. Between 1928 and 1933, the Hungarian research team of Joseph L. Svirbely and Albert Szent-Györgyi and, independently, the American Charles Glen King, first isolated ascorbic acid. There is continuing debate within the scientific community over the best dose schedule (the amount and frequency of intake) of vitamin C for maintaining optimal health in humans (Sardi 2004). It is generally agreed that a balanced diet without supplementation contains enough vitamin C to prevent acute scurvy in an average healthy adult, while those who are pregnant, smoke tobacco, or are under stress require slightly higher amounts of the nutrient (Institute of Medicine 2001). Recommendations for vitamin C intake have been set by various national and international agencies. The United Kingdom's Food Standards Agency and the World Health Organization recommend approximately 40-45 milligrams per day, while the North American Dietary Reference Intake advocates a somewhat higher amount: about 90 milligrams per day for an adult male, and 75 for an adult female. The U.S. National Academy of Sciences also sets a cap for dietary intake at 2 grams (2000 milligrams) per day (Institute of Medicine 2001). High doses (in the thousands of milligrams) may result in diarrhea, which is harmless if the dose is reduced immediately. Indigestion is another common side-effect of large doses, particularly if taken on an empty stomach. As vitamin C enhances iron absorption, iron poisoning can become an issue for people with rare iron overload disorders. Many pro-vitamin C organizations promote usage levels well beyond the current Dietary Reference Intake. The movement is led by scientists and doctors such as Robert Cathcart, Ewan Cameron, Steve Hickey, Irwin Stone, and the twice Nobel Prize laureate Linus Pauling, as well as the more controversial figure Matthias Rath. There is an extensive and growing scientific literature critical of governmental agency dose recommendations (Forman 1981). The biological halflife for vitamin C is fairly short (about 30 minutes in blood plasma), a fact that mainstream researchers have failed to take into account according to high-dose advocates (Sardi 2004). Most simians consume vitamin C in amounts 10 to 20 times higher than those recommended by governments for humans (Milton 1999). Based on this diet of our primate cousins (similar to what our common ancestors are likely to have consumed when the gene mutated), Pauling and Stone have calculated that the optimum daily requirement of vitamin C is around 2300 milligrams for a human requiring 2500 kcal a day (Milton 2003; Stone 1972; Pauling 1970). While the established RDA is sufficient for preventing acute scurvy, Pauling argues, it is not necessarily the dosage for optimal health. Since its discovery, vitamin C has been considered a universal panacea by some enthusiastic proponents. Other advocates of high dose vitamin C consider that if it is given "in the right form, with the proper technique, in frequent enough doses, in high enough doses, along with certain additional agents and for a long enough period of time, it can prevent and, in many cases, cure, a wide range of common and/or lethal diseases, notably the common cold and heart disease" (Levy 2002; Pauling 1970). A 1986 study indicates that vitamin C may be important in regulation of endogenous cholesterol synthesis (Harwood et al. 1986). Probably the most controversial issue, the putative role of ascorbate in the management of AIDS, is still unresolved, more than 16 years after a study published in the prestigious Proceedings of the National Academy of Sciences (USA) showed that non-toxic doses of ascorbate suppress HIV replication in vitro (Harakeh et al. 1990). No large-scale follow-up trials have been conducted. In January 2007, the US Food and Drug Administration approved a new trial of intravenous vitamin C as a cancer treatment for "patients who have exhausted all other conventional treatment options." Additional studies over several years will be needed to demonstrate its effectiveness (UPI 2007). 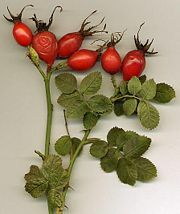 Rose hips are a particularly rich source of vitamin C.
The richest natural sources of vitamin C are fruits and vegetables; of the former, the camu camu fruit and the Kakadu plum contain the highest concentration of the vitamin. It is also present in some cuts of meat, especially liver, but not in significant quantities. Since the stability of ascorbic acid decreases with increases in temperature and pH, the nutritional value of foods containing the vitamin may be lost or diminished in high-temperature food preparation such as pressure cooking, roasting, frying, and grilling. Longer cooking times also add to this effect, as do copper food vessels, which catalyze the molecule's decomposition by oxidation. Another cause of vitamin C loss from food is a process called leaching, during which the water-soluble vitamin dissolves into the cooking water. However, vitamin C does not leach from all vegetables at the same rate; research shows that broccoli seems to retain more of the nutrient than other greens (Combs 1998). Research has also shown that fresh-cut fruit does not lose significant nutrients when stored in the refrigerator for a few days (Hitt 2006). While plants are generally a good source of vitamin C, the amount depends on the precise variety of the plant, the soil condition, the climate in which it grew, the length of time since it was picked, the storage conditions, and the method of preparation (Danish Veterinary and Food Administration 2007). Vitamin C is widely available as a tablet and powder. 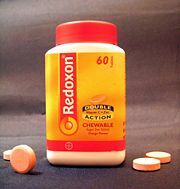 The Redoxon brand, launched in 1934 by Hoffmann-La Roche, was the first mass-produced synthetic vitamin C.
Vitamin C is the most widely taken nutritional supplement (Diet Channel 2007). It is available in many forms, including tablets, capsules, drink-mix packets, and as part of multi-vitamin formulas. In supplements, vitamin C most often comes in the form of various mineral ascorbates, as they are easier to absorb, more easily tolerated, and provide a source of several dietary minerals. Absorption of the vitamin is slowed by large quantities of sugar in the intestines or bloodstream. Ascorbic acid was the first vitamin to be artificially produced. Between 1933 and 1934, the British chemists Sir Walter Norman Haworth and Sir Edmund Hirst and, independently, the Polish chemist Tadeus Reichstein, succeeded in synthesizing the vitamin. Only Haworth was awarded the 1937 Nobel Prize in Chemistry for this work, but the process for vitamin-C synthesis retained Reichstein's name. In 1934, Hoffmann–La Roche became the first pharmaceutical company to mass-produce synthetic vitamin C, under the brand name of Redoxon. Vitamin C is produced from glucose by two main routes. The Reichstein process, developed in the 1930s, uses a single pre-fermentation followed by a purely chemical route. The modern two-step fermentation process, originally developed in China in the 1960s, uses additional fermentation to replace some of the later chemical stages. Both processes yield approximately 60 percent vitamin C from the glucose feed (Competition Commission 2001). Research is underway to create a strain of yeast that can synthesize vitamin C in a single fermentation step from galactose, a technology expected to reduce manufacturing costs considerably. Atkins, P., and L. Jones. 2005. Chemical Principles, 3rd ed. New York: W.H. Freeman. ISBN 071675701X. Bánhegyi, G., and J. Mándl. 2001. The hepatic glycogenoreticular system. Pathol Oncol Res 7(2):107-110. PMID 11458272. Combs, G. F. 1998. The Vitamins, Fundamental Aspects in Nutrition and Health, 2nd ed. San Diego, CA: Academic Press. ISBN 0121834921. Competition Commission. 2001. The production of vitamin C. Competition-commission. Retrieved February 20, 2007. Danish Veterinary and Food Administration. 2007. The vitamin and mineral content is stable. Danish Veterinary and Food Administration. Retrieved March 7, 2007. The Diet Channel. 2007. Vitamin C: General info. Diet Channel. Retrieved June 30, 2007. Expert Group on Vitamins and Minerals. 2003. Vitamin C: Risk assessment. UK Food Standards Agency. Retrieved February 19, 2007. Gund, P. 1977. Three-dimensional pharmacophoric pattern searching. Prog Mol Subcell Biol 11: 117–143. Harris, J. R. 1996. Ascorbic Acid: Subcellular Biochemistry. New York: Springer. ISBN 0306451484. Healthy Eating Club. 2001. Vitamin C Food Data Chart. Healthy Eating Clug. Retrieved March 7, 2007. Hediger, M. A. 2002. New view at C. Nature Medicine 8: 445-446. Hitt, Miranda. 2006. Fresh-cut fruit may keep its vitamins. WebMd. Retrieved February 25, 2007. Institute of Medicine of the National Academies. 2001. US Recommended Dietary Allowance (RDA). Institute of Medicine of the National Academies. Retrieved February 19, 2007. Kivirikko, K. I., and R. Myllyla. 1985. Post-translational processing of procollagens. Ann NY Acad Sci 460: 187–201. Levy, T. E. 2002. Curing the Incurable: Vitamin C, Infectious Diseases, and Toxins. Livon Books. ISBN 1401069630. Linster, C., and E. Van Schaftingen. 2007. Vitamin C: Biosynthesis, recycling and degradation in mammals. FEBS Journal 274(1): 1-22. Long, C., et al. 2003. Ascorbic acid dynamics in the seriously ill and injured. Journal of Surgical Research 109(2): 144–148. Martini, E. 2002. Jacques Cartier witnesses a treatment for scurvy. Vesalius 8(1): 2-6. Retrieved February 25, 2007. McGee, W. 2007. Ascorbic acid. Medical Encyclopedia. Retrieved June 30, 2007. Milton, K. 1999. Nutritional characteristics of wild primate foods: Do the diets of our closest living relatives have lessons for us? Nutrition 15(6): 488-498. The Natural Food Hub. 2001. Natural food-Fruit Vitamin C content. The Natural Food Hub. March 7, 2007. Nutrient Data Laboratory of the US Agricultural Research Service. 2007. National Nutrient Database. US Agricultural Research Service. Retrieved March 7, 2007. Padayatty, S., A. Katz, Y. Wang, P. Eck, O. Kwon, J. Lee, S. Chen, C. Corpe, A. Dutta, S. Dutta, and M. Levine. 2003. Vitamin C as an antioxidant: Evaluation of its role in disease prevention. J Am Coll Nutr 22(1): 18-35. Pauling, L. 1970. Evolution and the need for ascorbic acid. Proc Natl Acad Sci 67(4): 1643-1648. Peterkofsky, B. 1991. Ascorbate requirement for hydroxylation and secretion of procollagen: relationship to inhibition of collagen synthesis in scurvy. Am J Clin Nutr 54: 1135S–1140S. Prockop, D. J., and K. I. Kivirikko. 1995. Collagens: Molecular biology, diseases, and potentials for therapy. Annu Rev Biochem 64: 403–434. Proctor, P. 1970. Similar functions of uric acid and ascorbate in man? Nature 228(5274): 868. Sardi, B. 2004. Linus Pauling vindicated; Researchers claim RDA for vitamin C is flawed. Knowledge of Health. Retrieved February 20, 2007. Sardi, B. 2004. The Vitamin C fanatics were right all along. Knowledge of Health. Retrieved February 22, 2007. Stipanuk, M. H. 2000. Biochemical and Physiological Aspects of Human Nutrition. Philadelphia: Saunders. ISBN 072164452X. Stone, I. 1979. Eight decades of scurvy. The case history of a misleading dietary hypothesis. Orthomolecular Psychiatry 8(2): 58-62. Retrieved April 4, 2007. Stone, I. 1972. The Healing Factor: Vitamin C Against Disease. New York: Grosset and Dunlap. ISBN 0448116936. Stryer, L. 1995. Biochemistry, 4th edition. New York: W.H. Freeman. ISBN 0716720094. Svirbelf, J. L., and A. Szent-Gyorgyi. 1932. The chemical nature Of vitamin C. The National Library of Medicine. Retrieved June 30, 2007. United Press International (UPI). 2007. FDA OKs vitamin C trial for cancer. Physorg.com. Retrieved April 6, 2007. World Health Organization. 2004. Vitamin and mineral requirements in human nutrition, 2nd ed.. World Health Organization. Retrieved February 20, 2007. Cameron, E., and L. Pauling. 1979. Cancer and Vitamin C. Corvallis, OR: Pauling Institute of Science and Medicine. ISBN 0393500004. Levy, T. E. 2002. Vitamin C, Infectious Diseases, and Toxins. Xlibris. ISBN 1401069630. Pauling, L. 1976. Vitamin C, the Common Cold, and the Flu. New York: W. H. Freeman. ISBN 0716703610. Pearson, D. and S. Shaw. 1982. Life Extension: A Practical Scientific Approach. New York: Warner Books. ISBN 0446387355. This page was last modified on 23 January 2016, at 16:17.